This vehicle won't be on the lot long! Blurring highway lines with an exceptional merger of performance and opulence. Top features include remote keyless entry, an automatic dimming rear-view mirror, heated seats, and power seats. 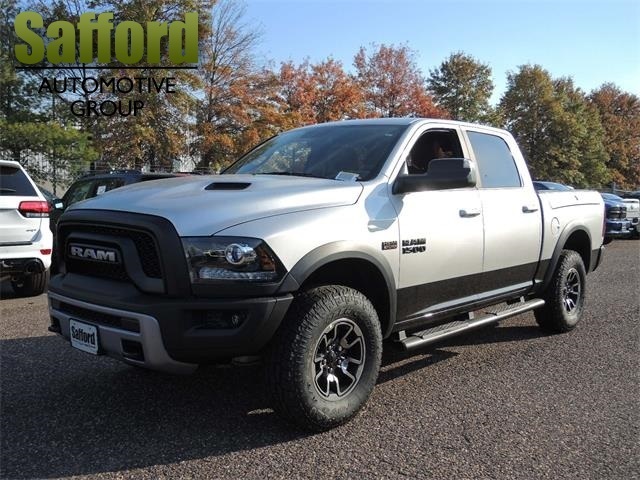 Under the hood you'll find an 8 cylinder engine with more than 350 horsepower, and load leveling rear suspension maintains a comfortable ride. Well tuned suspension and stability control deliver a spirited, yet composed, ride and drive We pride ourselves in consistently exceeding our customer's expectations. Stop by our dealership or give us a call for more information. 1500 Rebel, Rebel, You won't want to miss this excellent value! Without a doubt, this is a technologically advanced vehicle for the sport-inclined driving enthusiast! 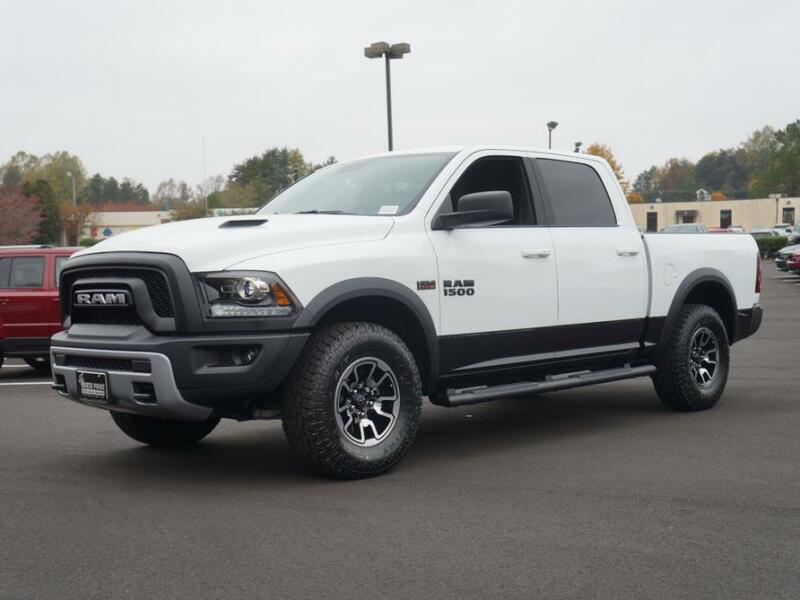 Top features include power windows, a trailer hitch, a bedliner, and much more. Smooth gearshifts are achieved thanks to the powerful 8 cylinder engine, and load leveling rear suspension maintains a comfortable ride. Well tuned suspension and stability control deliver a spirited, yet composed, ride and drive We pride ourselves in the quality that we offer on all of our vehicles. 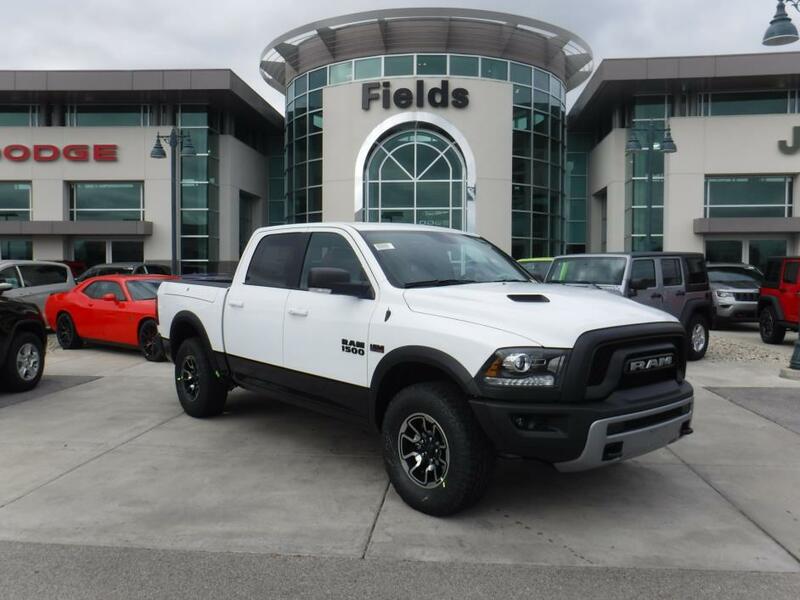 Stop by our dealership or give us a call for more information., 1 Yr. Trial,Remote Proximity Keyless Entry,Premium Cloth Seats w/Emboss Tread Pattern,17' Aluminum Spare Wheel,Integrated Voice Command w/Bluetooth,Trailer Tow Mirrors,GPS Antenna Input,Remote USB Port,Media Hub,Uconnect Access,Bed Cargo Divider/Extender,4 Adjustable Cargo Tie-Down Hooks,Next Generation Engine Controller,SIRIUSXM Satellite Radio,Auto Dim Exterior Mirrors,Engine: 5.7L V8 HEMI MDS VVT,Flat Black 5.7L Hemi Badge,Glove Box Lamp,5-Year SIRIUSXM Travel Link Service,Quick Order Package 26W Rebel,HD Radio,Dual Rear Exhaust w/Bright Tips,Heavy Duty Engine Cooling,Power Heated Fold-Away Mirrors,Exterior Mirrors w/Supplemental Signals,Radio: Uconnect 8.4 NAV,GPS Navigation,Flat Black Ram 1500 Badge,9 Alpine Speakers w/Subwoofer,Hemi Badge,Uconnect Access 1 Year Trial,Tip Start,Power Black Trailer Tow Mirrors,3.21 Rear Axle Ratio,Power-Folding Mirrors,Transfer Case Skid Plate Shield,SIRIUSXM Travel Link,Ram Glove Box Badge,Engine Oil Heat Exchanger,LED Bed Lighting,Exterior Mirrors Courtesy Lamps,Electronically Controlled Throttle,Keyless Go,Underhood Lamp,Trailer Tow Mirrors and Brake Group,Front Suspension Skid Plate,Protection Group,Universal Garage Door Opener,5-Year SIRIUSXM Traffic Service,32 Gallon Fuel Tank,Bright Rotary Shifter,Sun Visors w/Illuminated Vanity Mirrors,Trailer Brake Control,Rear View Auto Dim Mirror,Transmission: 8-Speed Automatic,Black Tubular Side Steps,Luxury Group,Overhead Console w/Garage Dr Opener,RamBox Cargo Management System,Electronic Shift,Spray In Bedliner,Rear Dome w/On/Off Switch Lamp,Heavy Duty Transmission Oil Cooler,Audio Jack Input for Mobile Devices,8.4' Touchscreen Display,50 State Emissions,SIRIUSXM Traffic You won't want to miss this excellent value! Without a doubt, this is a technologically advanced vehicle for the sport-inclined driving enthusiast! 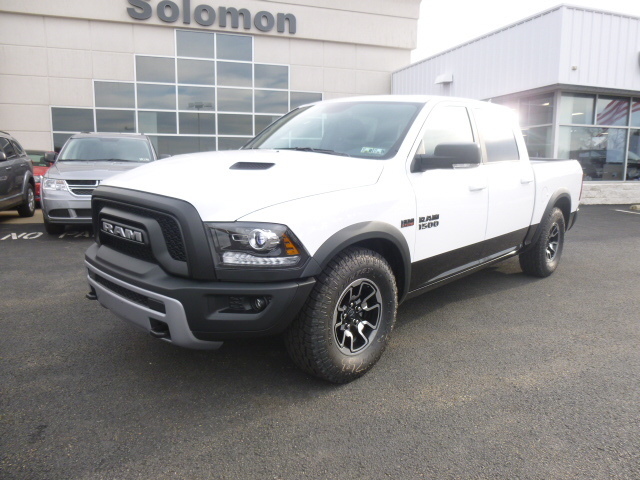 Top features include power windows, a trailer hitch, a bedliner, and much more. Smooth gearshifts are achieved thanks to the powerful 8 cylinder engine, and load leveling rear suspension maintains a comfortable ride. Well tuned suspension and stability control deliver a spirited, yet composed, ride and drive We pride ourselves in the quality that we offer on all of our vehicles. Stop by our dealership or give us a call for more information. Power Sunroof,1 Yr. Trial,Premium Cloth Seats w/Emboss Tread Pattern,Remote Proximity Keyless Entry,17' Aluminum Spare Wheel,Integrated Voice Command w/Bluetooth,GPS Antenna Input,Remote USB Port,Media Hub,Uconnect Access,Next Generation Engine Controller,SIRIUSXM Satellite Radio,Auto Dim Exterior Mirrors,Engine: 5.7L V8 HEMI MDS VVT,Flat Black 5.7L Hemi Badge,5-Year SIRIUSXM Travel Link Service,Glove Box Lamp,Quick Order Package 26W Rebel,HD Radio,Dual Rear Exhaust w/Bright Tips,Heavy Duty Engine Cooling,Power Heated Fold-Away Mirrors,Radio: Uconnect 8.4 NAV,Exterior Mirrors w/Supplemental Signals,GPS Navigation,Flat Black Ram 1500 Badge,9 Alpine Speakers w/Subwoofer,Hemi Badge,Uconnect Access 1 Year Trial,Tip Start,Power-Folding Mirrors,SIRIUSXM Travel Link,Ram Glove Box Badge,Engine Oil Heat Exchanger,LED Bed Lighting,Exterior Mirrors Courtesy Lamps,Electronically Controlled Throttle,Keyless Go,Underhood Lamp,Universal Garage Door Opener,5-Year SIRIUSXM Traffic Service,Bright Rotary Shifter,Sun Visors w/Illuminated Vanity Mirrors,Trailer Brake Control,Transmission: 8-Speed Automatic,Rear View Auto Dim Mirror,Luxury Group,Overhead Console w/Garage Dr Opener,Electronic Shift,Rear Dome w/On/Off Switch Lamp,Heavy Duty Transmission Oil Cooler,Audio Jack Input for Mobile Devices,8.4' Touchscreen Display,50 State Emissions,SIRIUSXM Traffic You won't want to miss this excellent value! 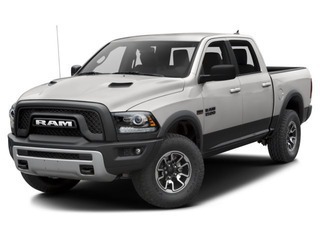 This pickup successfully merges advanced capability with comfort and agility, distinguishing itself from the competition with its cargo capacity, towing capacity, and ruggedness! Top features include power windows, heated steering wheel, power moon roof, and cruise control. Smooth gearshifts are achieved thanks to the powerful 8 cylinder engine, and load leveling rear suspension maintains a comfortable ride. Well tuned suspension and stability control deliver a spirited, yet composed, ride and drive Our aim is to provide our customers with the best prices and service at all times. Stop by our dealership or give us a call for more information.Call 855-384-3034 and ask for Mike Nath in the Commercial Sales Department. 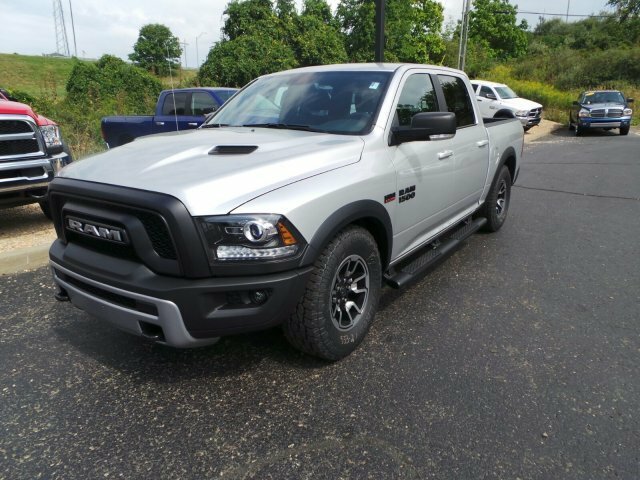 Thank you for viewing our new 2017 Ram 1500 Crew Cab Rebel 4x4 Truck! There are currently $1750 in Southeastern Region Cash Rebates. You may qualify for many other rebates. Rebates are scheduled to expire on 11/30/2016. Call or email now to confirm your rebates and get your true ePrice! 1500 Rebel, Rebel, Please contact us to determine which current programs you qualify for so we can quote you the lowest price possible! You will always get a great deal at Fields! Special Finance Rates (in lieu of Cash Allowance) $500 Military Discount $1000 Conquest Lease to Retail (select vehicles) $1000 Lease Loyalty (select vehicles) $500 Realtor Discount (select vehicles) $500 FFA (select vehicles) Affiliate Rewards USAA Member Discount (select vehicles) Target Direct Mailer Discount Financing for qualified buyers through Chrysler Capital, not all buyers qualify., Power Sunroof,1 Yr. Trial,Remote Proximity Keyless Entry,Premium Cloth Seats w/Emboss Tread Pattern,17' Aluminum Spare Wheel,Integrated Voice Command w/Bluetooth,GPS Antenna Input,Remote USB Port,Media Hub,Uconnect Access,Bed Cargo Divider/Extender,4 Adjustable Cargo Tie-Down Hooks,Next Generation Engine Controller,SIRIUSXM Satellite Radio,Flat Black 5.7L Hemi Badge,Engine: 5.7L V8 HEMI MDS VVT,Auto Dim Exterior Mirrors,5-Year SIRIUSXM Travel Link Service,Glove Box Lamp,HD Radio,Quick Order Package 26W Rebel,Dual Rear Exhaust w/Bright Tips,Heavy Duty Engine Cooling,Power Heated Fold-Away Mirrors,Exterior Mirrors w/Supplemental Signals,Radio: Uconnect 8.4 NAV,GPS Navigation,Flat Black Ram 1500 Badge,9 Alpine Speakers w/Subwoofer,Hemi Badge,Uconnect Access 1 Year Trial,Tip Start,Power-Folding Mirrors,Transfer Case Skid Plate Shield,SIRIUSXM Travel Link,Ram Glove Box Badge,Engine Oil Heat Exchanger,LED Bed Lighting,Exterior Mirrors Courtesy Lamps,Electronically Controlled Throttle,Keyless Go,Underhood Lamp,Front Suspension Skid Plate,Protection Group,Universal Garage Door Opener,5-Year SIRIUSXM Traffic Service,32 Gallon Fuel Tank,Bright Rotary Shifter,Sun Visors w/Illuminated Vanity Mirrors,Trailer Brake Control,Transmission: 8-Speed Automatic,Locking Lug Nuts,Rear View Auto Dim Mirror,Luxury Group,Rear Window Defroster,Overhead Console w/Garage Dr Opener,RamBox Cargo Management System,Spray In Bedliner,Electronic Shift,Rear Dome w/On/Off Switch Lamp,Heavy Duty Transmission Oil Cooler,Audio Jack Input for Mobile Devices,50 State Emissions,8.4' Touchscreen Display,SIRIUSXM Traffic Please contact us to determine which current programs you qualify for so we can quote you the lowest price possible! You will always get a great deal at Fields! Special Finance Rates (in lieu of Cash Allowance) $500 Military Discount $1000 Conquest Lease to Retail (select vehicles) $1000 Lease Loyalty (select vehicles) $500 Realtor Discount (select vehicles) $500 FFA (select vehicles) Affiliate Rewards USAA Member Discount (select vehicles) Target Direct Mailer Discount Financing for qualified buyers through Chrysler Capital, not all buyers qualify. New Price! Priced below KBB Fair Purchase Price! Carfax One-Owner. GPS / Navigation**, Moonroof / Sunroof**, Ram 1500 Rebel -- BB --, 4D Crew Cab, HEMI 5.7L V8 Multi Displacement VVT, 4WD, Auto-leveling suspension, Electronic Stability Control. 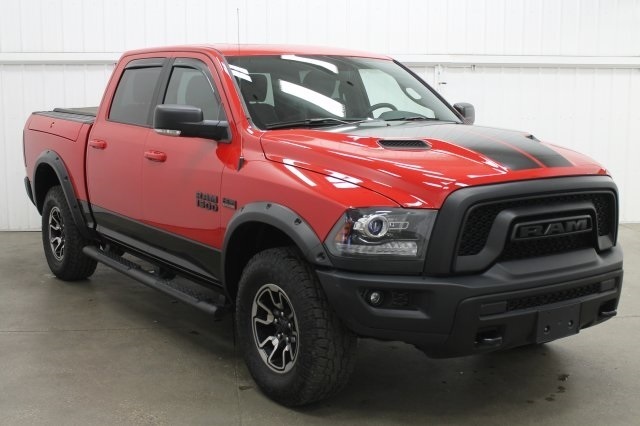 HEMI 5.7L V8 Multi Displacement VVT Odometer is 5799 miles below market average! Reviews: * Smooth-riding coil spring rear suspension also enables air-suspension option excellent trio of engine choices smooth and efficient eight-speed automatic transmission Rebel 1500 off-road package more than just stickers cabin is quiet and attractive straightforward controls and audio. according to Edmunds * Massive interior room low step-in height available fuel-efficient diesel engine. as stated by Edmunds We will pay top dollar for your car, even if you don't buy one from us! Don't make a $2000 mistake and pay too much somewhere else! Be sure to check with us before you buy! 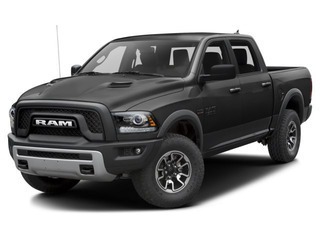 Truck Crew Cab, V-8 cyl 5.7L, 8 speed automatic, 4x4, Regular Unleaded, 4 door, Brilliant Black Crystal Pearlcoat, Red/Black, 1 Yr. Trial,17' Aluminum Spare Wheel,5-Year SIRIUSXM Traffic Service,5-Year SIRIUSXM Travel Link Service,50 State Emissions,8.4' Touchscreen Display,9 Alpine Speakers w/Subwoofer,Audio Jack Input for Mobile Devices,Auto Dim Exterior Mirrors,Bright Rotary Shifter,Dual Rear Exhaust w/Bright Tips,Electronic Shift,Electronically Controlled Throttle,Engine Oil Heat Exchanger,Engine: 5.7L V8 HEMI MDS VVT,Exterior Mirrors Courtesy Lamps,Exterior Mirrors w/Supplemental Signals,Flat Black 5.7L Hemi Badge,Flat Black Ram 1500 Badge,Front Suspension Skid Plate,GPS Antenna Input,GPS Navigation,Glove Box Lamp,HD Radio,Heavy Duty Engine Cooling,Heavy Duty Transmission Oil Cooler,Hemi Badge,Integrated Voice Command w/Bluetooth,Keyless Go,LED Bed Lighting,Luxury Group,Media Hub,Next Generation Engine Controller,Overhead Console w/Garage Dr Opener,Power Heated Fold-Away Mirrors,Power Sunroof,Power-Folding Mirrors,Premium Cloth Seats w/Emboss Tread Pattern,Protection Group,Quick Order Package 26W Rebel,Radio: Uconnect 8.4 NAV,Ram Glove Box Badge,Rear Dome w/On/Off Switch Lamp,Rear View Auto Dim Mirror,Remote Proximity Keyless Entry,Remote USB Port,SIRIUSXM Satellite Radio,SIRIUSXM Traffic,SIRIUSXM Travel Link,Sun Visors w/Illuminated Vanity Mirrors,Tip Start,Trailer Brake Control,Transfer Case Skid Plate Shield,Transmission: 8-Speed Automatic,Uconnect Access,Uconnect Access 1 Year Trial,Underhood Lamp,Universal Garage Door Opener Please call 866-535-4812 for additional information and to speak with someone in our commercial truck sales. 1500 Rebel, Rebel, If your looking for quality customer service and a friendly atmosphere, come on down to Sunset Chrysler and let us show you how much we value and appreciate the opportunity for your potential business. The sales staff here at Sunset is dedicated to making customer satisfaction the NUMBER ONE priority!, 1 Yr. Trial,17' Aluminum Spare Wheel,32 Gallon Fuel Tank,4 Adjustable Cargo Tie-Down Hooks,5-Year SIRIUSXM Traffic Service,5-Year SIRIUSXM Travel Link Service,50 State Emissions,8.4' Touchscreen Display,Audio Jack Input for Mobile Devices,Bed Cargo Divider/Extender,Bright Rotary Shifter,Dual Rear Exhaust w/Bright Tips,Electronic Shift,Electronically Controlled Throttle,Engine Oil Heat Exchanger,Engine: 5.7L V8 HEMI MDS VVT,Exterior Mirrors Courtesy Lamps,Exterior Mirrors w/Supplemental Signals,Flat Black 5.7L Hemi Badge,Flat Black Ram 1500 Badge,GPS Antenna Input,GPS Navigation,HD Radio,Heavy Duty Engine Cooling,Heavy Duty Transmission Oil Cooler,Hemi Badge,Integrated Voice Command w/Bluetooth,Keyless Go,LED Bed Lighting,Media Hub,Next Generation Engine Controller,Power Black Trailer Tow Mirrors,Premium Cloth Seats w/Emboss Tread Pattern,Quick Order Package 26W Rebel,Radio: Uconnect 8.4 NAV,Ram Glove Box Badge,RamBox Cargo Management System,Remote Proximity Keyless Entry,Remote USB Port,SIRIUSXM Satellite Radio,SIRIUSXM Traffic,SIRIUSXM Travel Link,Spray In Bedliner,Tip Start,Trailer Brake Control,Trailer Tow Mirrors,Trailer Tow Mirrors and Brake Group,Transmission: 8-Speed Automatic,Uconnect Access,Uconnect Access 1 Year Trial If your looking for quality customer service and a friendly atmosphere, come on down to Sunset Chrysler and let us show you how much we value and appreciate the opportunity for your potential business. The sales staff here at Sunset is dedicated to making customer satisfaction the NUMBER ONE priority!